They are two Ontario communities that suffered major disasters at similar times. The wealthier one, however, has come out stronger while the other is still struggling to rebuild. That, says Laurier Professor Brenda Murphy, is an environmental justice issue. Goderich, an affluent tourist town of 7,500 in southern Ontario, was hit by an F3 tornado in 2011. It severely damaged many buildings and houses, including in the historic downtown. Wawa, a former mining town of 3,000 in northern Ontario, and the tiny nearby Michipicoten First Nation, suffered major flooding in 2012, which cut off both communities from road access and damaged a great deal of infrastructure. For their Master of Environmental Studies major research projects, Kylie Hissa and Samantha Russo researched Goderich and Wawa respectively. Working with Murphy and PhD candidate Bryce Gunson, project manager of the Laurier-based Resilient Communities Research Collaborative, they undertook similar projects. What they learned was in some ways strikingly different. Hissa first visited Goderich in May of 2016. She found it “absolutely gorgeous.” The only visible signs of the tornado’s aftermath were some fallen trees and debris in a cemetery. “I would imagine that if anyone had come in without realizing what had happened, they probably wouldn’t have been able to tell,” she says. Goderich was able to raise “a staggering amount of money” for its reconstruction and many of the buildings were not only restored, they were also built stronger, more accessible, and up to code, says Murphy, who is Society, Culture and Environment program chair and a Laurier faculty member in Geography and Social Justice and Community Engagement. Not so in Wawa (pictured) and Michipicoten First Nation. When Russo first visited in June 2016, many areas “looked like the disaster happened just yesterday,” she says. Russo saw a severely damaged motel that hadn’t been rebuilt, a large hole where land had caved in, debris in forests, and littered water bodies. “I had seen a lot of photos of the disaster prior to arriving, but I was shocked at the damage left behind four years after the flood,” she says. Murphy has worked for years on helping rural and Indigenous communities prepare for disasters. She says climate change will bring more disasters across Canada, including more severe weather, increased fire risk, drought and flooding. While southern cities will also face risks, the difference lies in their capacities. “Most of the rules and regulations for how communities manage disasters are put into place by urban politicians in an urban environment with large budgets,” says Murphy. 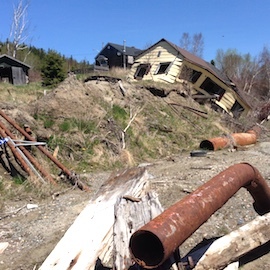 In Michipicoten First Nation, for example, both the chief and the acting band manager happened to be away from the community when the floods occurred. The band’s public works administrator had to take on much of the work of liaising with Wawa and getting the 65 resident band members evacuated. In general, First Nations communities face huge everyday challenges stemming from hundreds of years of colonialism – suicide, substance abuse, infrastructure and systemic problems. This makes it difficult to focus on climate change adaptation, says Murphy. Murphy played a major part in developing two online resource guides, Aboriginal Disaster Resilience Planning and Rural Disaster Resilience Planning. She has already seen some success stories. At the Prince Albert Grand Council in Saskatchewan, when a forest fire was threatening a community, community members managed to save a lot of houses by “going in with picks and shovels,” doing perimeter work and getting in fire equipment, says Murphy. There have been planning successes too. The Tobique First Nation in New Brunswick, for instance, has adapted a nationally accredited system for critical incident stress management to create a culturally appropriate way of responding to emergencies. It has also worked with four neighbouring communities to create a mutual assistance network. “When your own community is in crisis, it’s hard for you to respond,” says Murphy. Murphy works closely with students on many of her projects and they have contributed a lot, she says. Both Hissa and Russo’s projects use photovoice, a participatory research technique that sends community members out with cameras to document what’s important to them – in this case, focusing on their communities’ disaster recovery. The students used the resulting pictures and information from interviews to come up with a set of themes that captured the communities’ experiences. The pictures and themes were presented at open houses that provided community members with a sense of voice and closure. Murphy and her team are now working on a comparative analysis and are planning to present it to the Ontario government, which funded the research. She hopes the research will result in more equitable disaster recovery policies and funding. Hissa, who is finishing up some work with Murphy as she looks for a longer-term job, says she learned a lot from the project and from Murphy.